I accelerated hard out of the curve, pushing tight against the apex and to the limits of adhesion from the Nitto Grapplers. 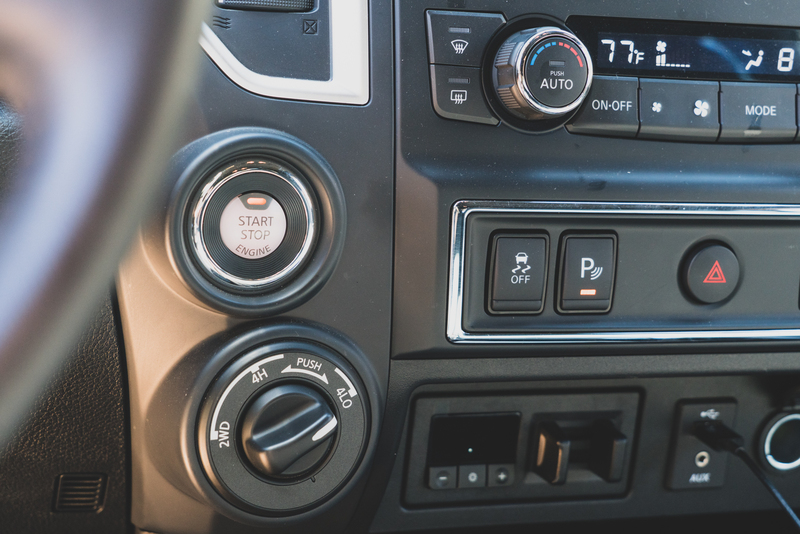 The Cummins diesel pulled strong and sent me into the next bend with more momentum than an 8,000-pound truck should, and with a bigger smile on my face than I expected a full-size truck could generate. 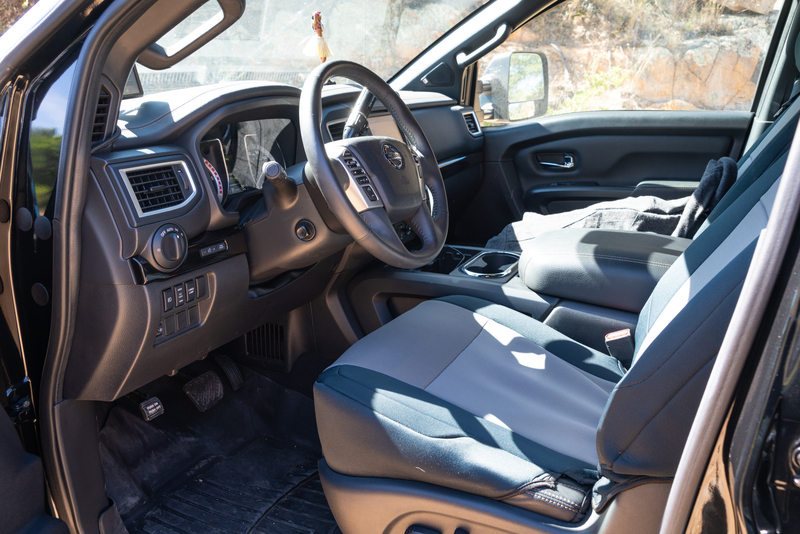 I have come to love a proper turbo-diesel, and the Titan XD has it with 555 pound-feet of torque and 310 horsepower, paired with a 6-speed Aisin automatic transmission. I drove for days along the coast of California, enjoying the stunning views from Highway 1. 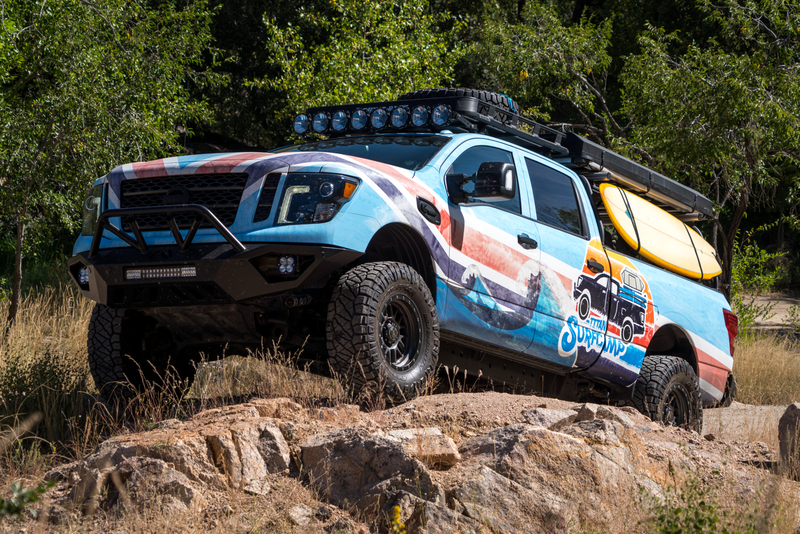 It seemed like a fitting route for this special project vehicle, the Surfcamp, a Titan prepared for exploring the coast, fishing, camping, and surfing along any sunkissed coastline. 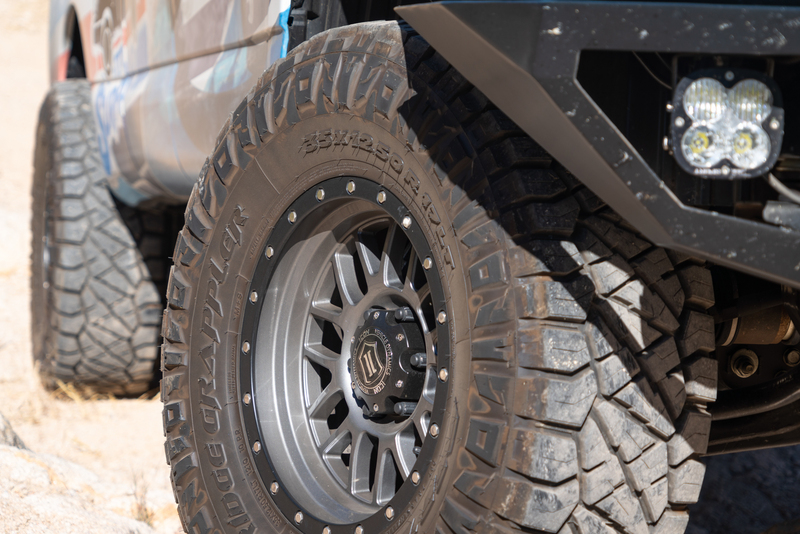 One of the first things I noticed about the Surfcamp was the taller stance, a combination of the 3-inch ICON Stage 5 suspension and the 35-inch Nitto Ridge Grapplers on Icon Alpha wheels. This helped with the breakover angle from the long wheelbase and the approach and departure angle from the longer overhangs. 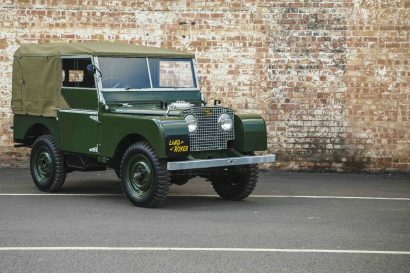 Both on the road and off, the long-travel suspension with remote reservoirs and application-specific valving was impressive, and never faded even after prolonged sessions on corrugated roads. One of the more notable features of the front suspension are the upper control arms with Delta Joints, which allow for a 32-percent increase in wheel travel, but without the noise of typical heim joints. This permits the front independent suspension to be lifted a full 3 inches and still allow for adequate extension travel. Also notable is that this suspension is a factory available option and covered by the 100,000-mile Nissan warranty. 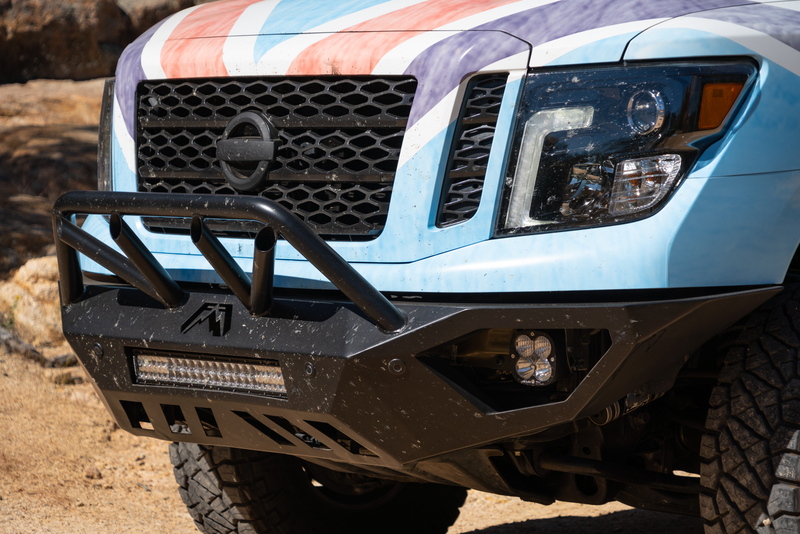 To protect the front and rear of the Titan, a set of Fab Four Vengeance Series bumpers were installed. The front is not visually my cup of tea, but it does significantly improve approach angle over the stock unit. 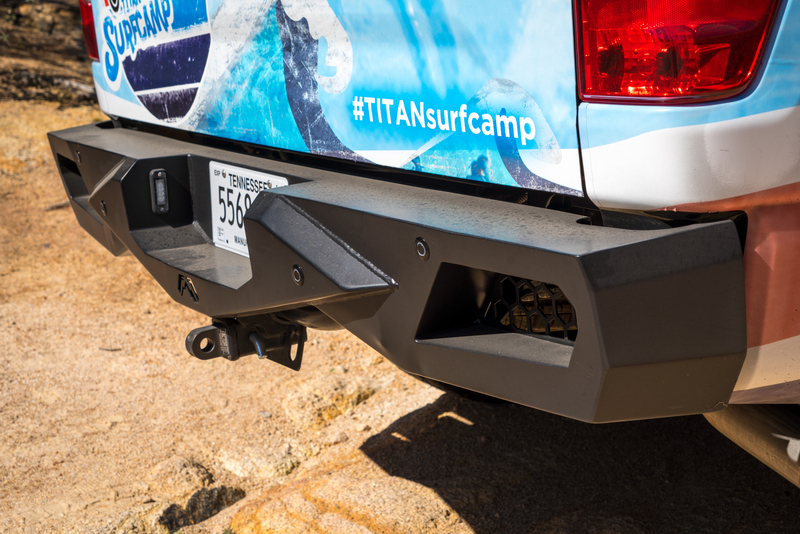 In keeping with the beach camp theme, the bumper was modified with fishing rod holders. 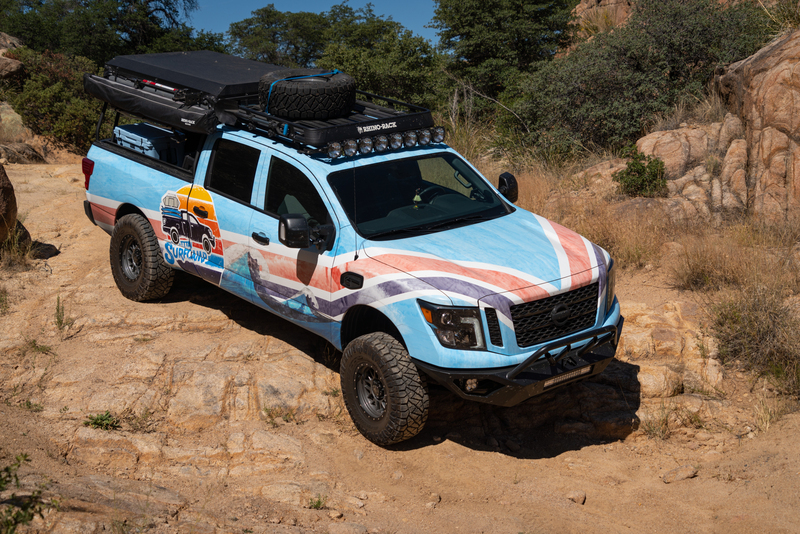 For lighting, they sourced a Rigid E-Series light bar, Baja Designs XL9s in the corners, and a row of KC Pro 6s along the front of the Rhino-Rack roof rack. 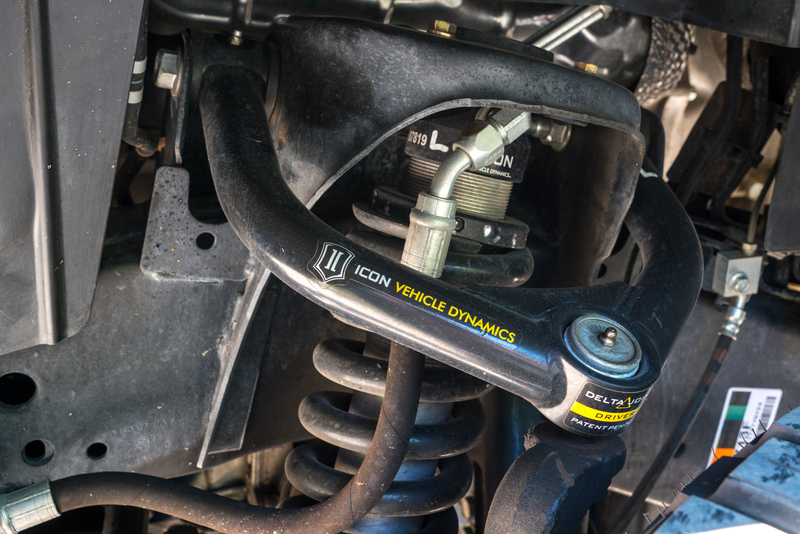 Performance on the trail was good, particularly at speed; the Icon suspension provides high driver confidence and control. Despite the weight at the front end (from the bumper and diesel motor), larger bumps were well-rounded with minimal bottoming. In 2WD with vehicle stability disabled, the rear stepped out nicely into predictable oversteer, and the grip of the Nittos helped minimize understeer. I liked the brakes too, which were strong and easy to modulate. 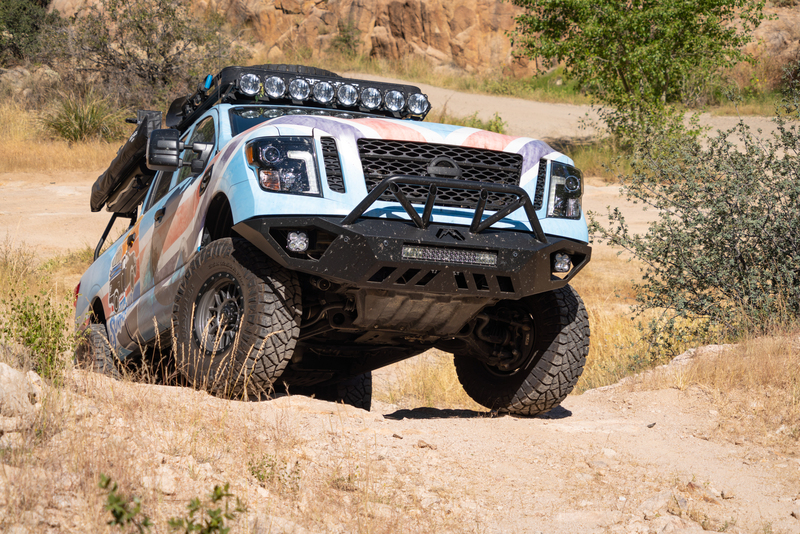 The only limitation in technical terrain was the overall size of the Titan and the lack of a locking differential, which would have helped with low-speed control. 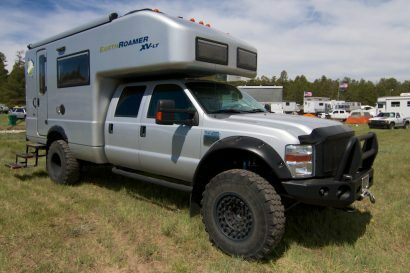 I would also want a winch and/or a set of four MaxTrax for self-recovery in the sand, the vehicle’s intended environment. The Surfcamp was thoughtfully laid out and accessorized for long camping forays, fitted with a laundry list of overlanding favorites. 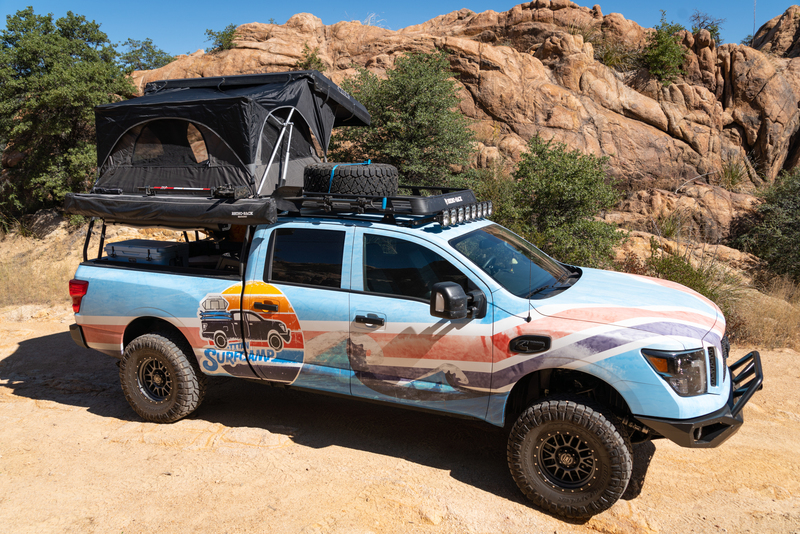 For the bed rack, they spec’d the well-respected Leitner Designs cargo system, which included a custom surfboard mount on the driver’s side, and a Rhino-Rack Batwing awning, Road Shower, and Hi-Lift jack on the passenger side. 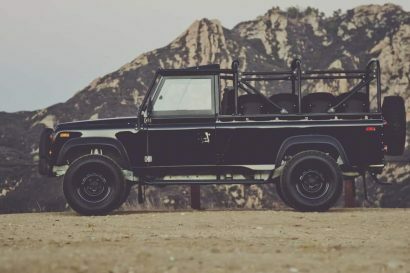 The forward Rhino-Rack rack holds the spare tire (which I suspect does not fit in the stock location) and a shovel. 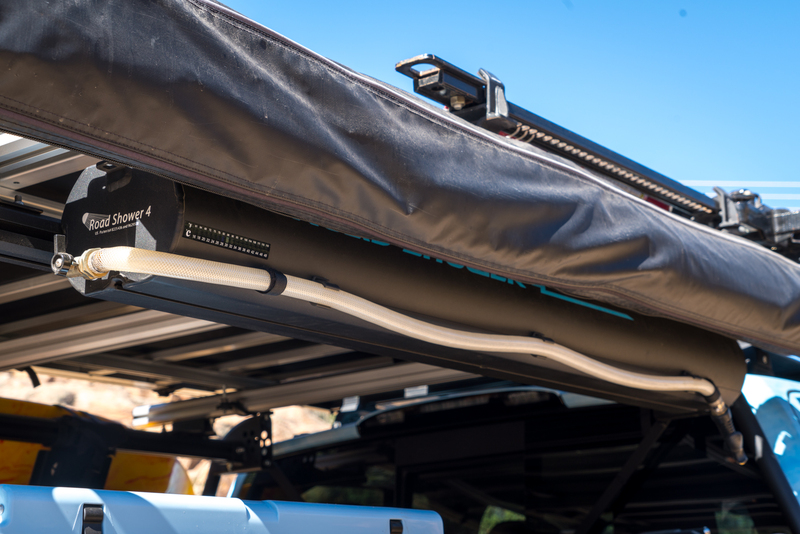 For sleeping, there is a Freespirit Recreation Elite Series electric roof tent which only requires unlatching a few straps before pushing a button and watching the hard shell lift to reveal a comfy abode. For organization, the foundation is a full-length Decked drawer system with interior bins and dividers. We have found these systems to be extremely durable in the field, and they allow for loading and lashing additional equipment to the deck. 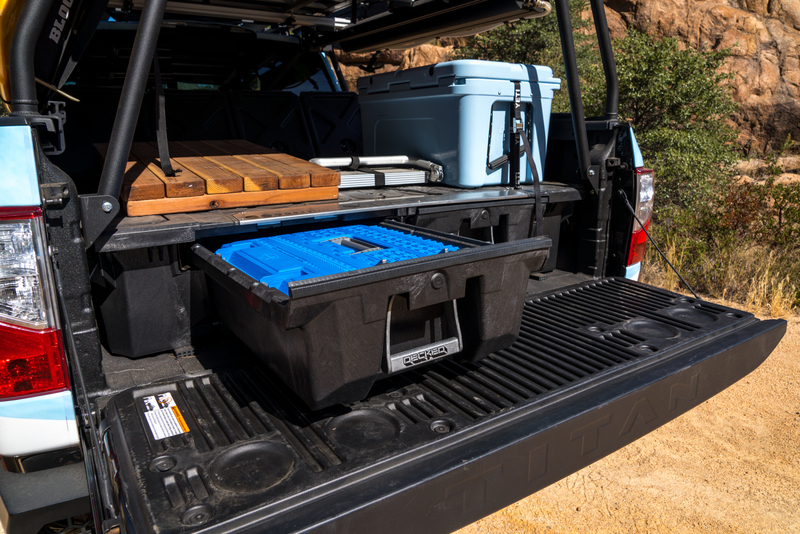 The Leitner side boxes also make for quick and easy access to recovery gear and other trail supplies. 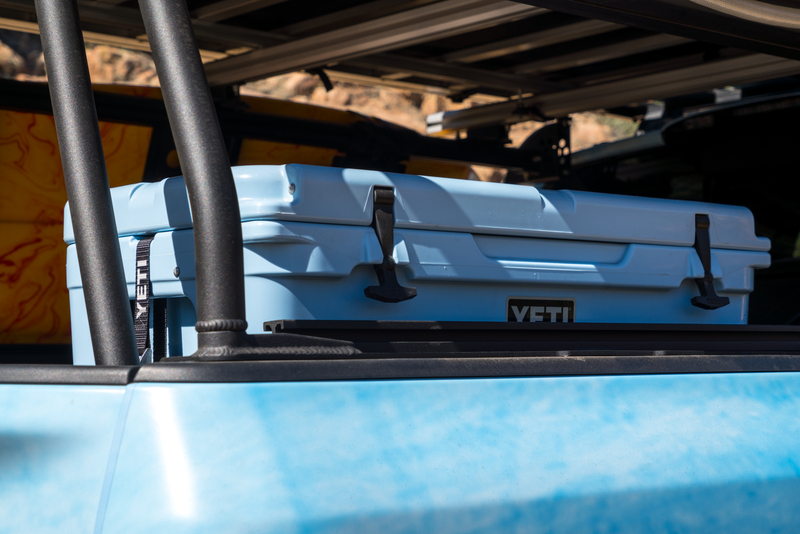 Stashed in the bed are a Yeti Tundra 45 cooler, a wood shower grate, and a Chris Birch surfboard.